Note: This post has been put together due to high request on my instagram. So the pics are not shot with my regular camera and there is no long text here. But I hope that you still like it – let me know if you like these spontaneous & short blogposts too? i love the milkmaid trend that’s going on right now! (: so many wonderful pieces! The top is so pretty Tina, it is right up my street , love white tops in general. Your beaded bag is rather cute and I have been on the look out for one too, this just made me want it even more. You always put things together in such a stunning way and find the most wonderful pieces. This whole look is so classic and I’m in love with the bag! Ein toller Look! 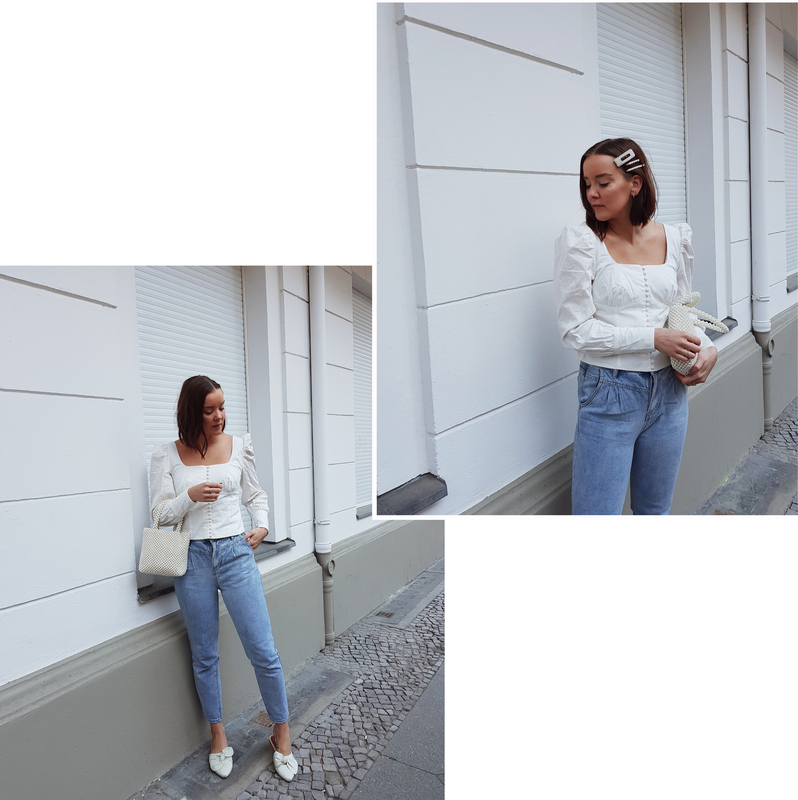 Die Bluse ist richtig süß und die Tasche perfekt dazu! Ich liebe deine Haarspangen! Sooo cute! Liebe Grüße! This outfit has so many of my favorite things lately!! I’ve been loving that style of top so much! Oh love this top with the high waist jeans and the pearl bag and hair pins are so chic. I need to get some of these hair pins!! dein Stil verzaubert mich einfach immer wieder. Ich liebe es wie du dir treu bleibt und trotzdem immer neue Trends und Details einbringst. I’m soooo in love with the sleeves of your top and theses hair clips are stunning ! You’re so trendy in this outfit. Such a cute outfit! Love your top and barrettes! You look so pretty and cute. I love the pearl accessory trend. I even bought some socks with pearls.